Yellowstone Park Foundation held it’s second annual young patron’s benefit at Avenue this past Thursday. I had the pleasure of being invited again by my lovely friend, and trailblazing young philanthropist, Arielle Patrick. The benefit also marked the launch of Yellowstone National Park’s Young Patron program as part of a broader effort to engage millennial communities in its conservation efforts. Jacqueline Rooney, a longtime member of YPF’s Advisory Council and corporate communications manager at Facebook, Inc. spearheaded the initiative to create a Young Patrons Board. Rooney, along with new board members Arielle Patrick, a Group Manager at Weber Shandwick, and Alice Ryan, a Director at KBS (kirshenbaum bond senecal + partners) hosted the gala. I wore an Italian vintage yellow gown which included built in shorts in the front. This was one of my chosen looks from New York Fashion Week that I didn’t have a chance to wear, so it was really nice to finally get the opportunity to wear this baby. Looking back now I realize how befitting this ‘yellow’ gown was for the Yellowstone National Park theme! I usually match my looks to the theme of a gala, but this time was a completely unintentional coincidence. The evening’s sponsors included: TAO Group, Stella Artois, Punzoné Organic Vodka, Archer Roose, Dorrian’s, Wyoming Whiskey, Whispering Angel and Lenny Emery. The Yellowstone Park Foundation (YPF) has served as Yellowstone National Park's official fundraising partner since 1996. Its mission is to fund projects and programs that protect, preserve, and enhance the natural and cultural resources, and the visitor experience of the Park. YPF has raised more than $100 million, and funded more than 325 important projects and initiatives since 1996 that include wildlife research, cutthroat trout restoration, trail maintenance, and youth education. For more information, please go to www.ypf.org. A few minutes after arriving at the Yellowstone National Park benefit I was warmly greeted by Arielle who looked ever so lovely in her sequin blue Jay Godfrey dress. We chatted for a few minutes before Arielle resumed her hosting duties and continued to ensure the evening’s execution was a success. 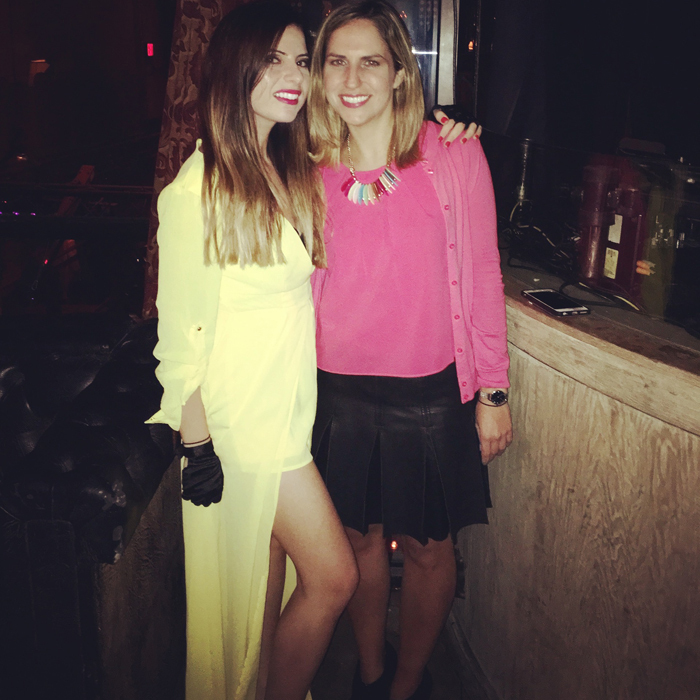 Arielle’s co-hosts, Alice Ryan (left), Jackie Rooney looked equally gorgeous in their multi-dimensional cocktail dresses. An hour in the benefit the lovely hosting trio took the stage to thank guests for coming and supporting the Yellowstone National Park. Jackie thanked her host committee for their hard work and mentioned how the evening was also a celebration of the park’s recent centennial. The evening included a fabulous silent auction with a roster of all the luxury items you heart could possibly desire. 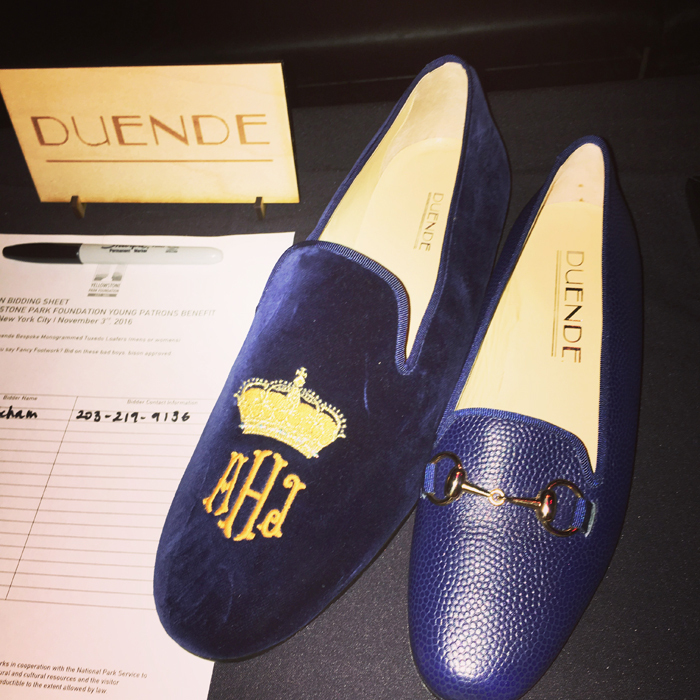 One of my favorites were the above Duende monogrammed his and her flats. Really want a pair of these (AF) velvet babies in every color, please! It was so much fun walking around the room and seeing all the interesting worldly looking characters dressed in their finest suits, and cocktail dresses. It’s perhaps one of my favorite things to do at functions like these. You never know who you’re going to meet, and of course I love to see what everyone is wearing! Robyn and me are basically the same person sometimes, as the first thing we did was bee-line towards the food. Priorities am I right?! Forget husband hunting, networking, and posing for photographer pictures, food is always first. ;) Luckily we found a delectable selection from Dorrian’s who catered the event. Thank you so much Arielle, and the Yellowstone National Park Young Patron’s committee for extending the invitation for me to cover the second annual benefit. Last year’s benefit was fantastic, but you guys hit it out of the park (pun intented) this year!